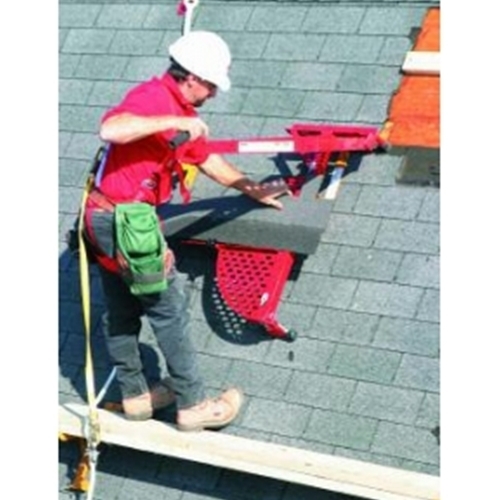 Cuts both asphalt or fiberglass shingles at any angle, face up or face down. Comes with standard guide plus offset guide for 18" architectural style shingles. Cold rolled steel construction with powder coat paint finish. Patented action, no blade to sharpen or replace. 180 degree capability; easily adjusted. Comes with a self-cleaning arm, rubber feet and an open mesh table. It is easily adjusted. Weighs 38 lbs. Mounts on roof 3 different ways.